It’s a beautiful day when you stumble upon that sweet combination of healthy meals that take almost no effort at all. 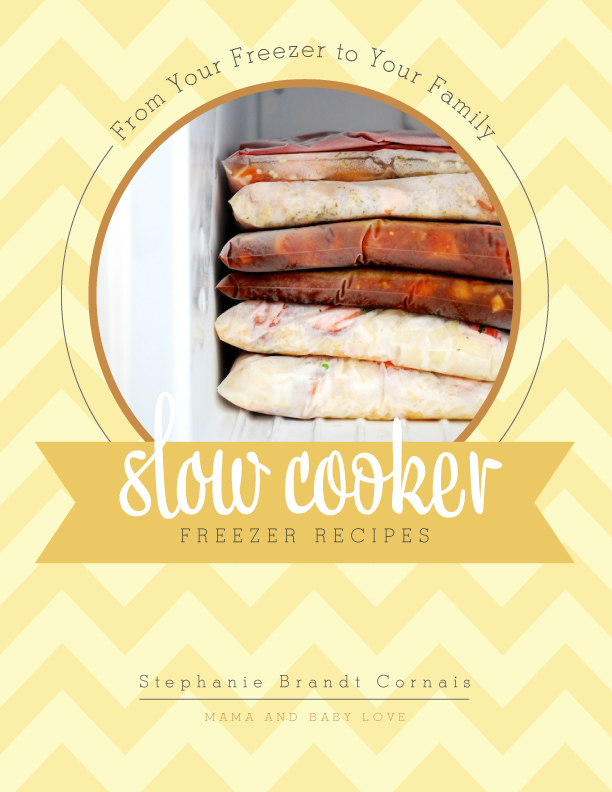 Stephanie Brandt Cornais, from Mama and Baby Love, has mastered the art of easy and delicious slow cooker cooking with Real Food in her revised and updated eCookbook, From Your Freezer to Your Family: Slow Cooker Freezer Recipes . From Your Freezer to Your Family: Slow Cooker Freezer Recipes is all about feeding your family with healthier options, like buying from your local farmers. Stephanie gives helpful tips about how to transition your way of cooking into a Real Food one. This revised and updated eCookbook contains 15 new recipes that are 95% grain-free, gluten-free and diary-free, to focus on foods that are best for your body. Not only do I hope these recipes make you healthier, feel better and lose weight, I hope you enjoy the amount of time it will save you in your life! 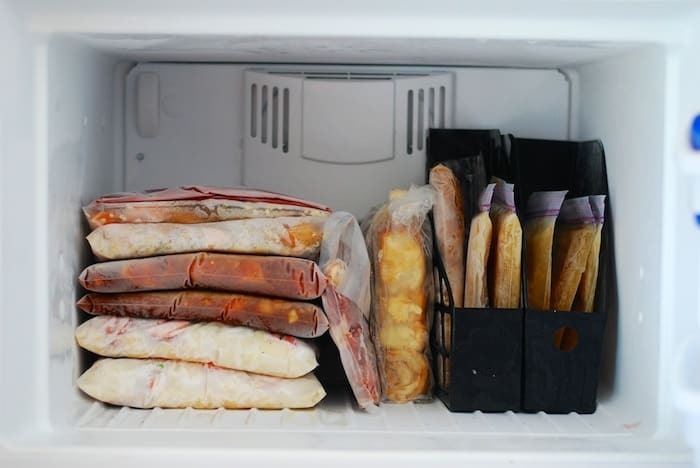 How I would give for my freezer to look like this. Inside From Your Freezer to Your Family: Slow Cooker Freezer Recipes you will find an updated grocery list that makes for quick trips to the supermarket, as well as, blank pages in the back to jot down any extra notes. This process may seem a little overwhelming at first, which is why Stephanie has a full breakdown of the best ways to start preparing your frozen meals. We haven’t even gotten to the recipes part yet. From Your Freezer to Your Family: Slow Cooker Freezer Recipes is filled with mouth-watering recipes like, Summer Veggie Soup, Thai Chicken Curry, Moroccan Lamb Stew, and Flank Steak Fajitas. The whole family is sure to gobble up these flavorful meals, and the bite size pieces make it perfect for a little one as young as 10-months to eat too. You can buy your copy of the revised and updated From Your Freezer to Your Family: Slow Cooker Freezer Recipes for $9.99 here. Want to try out a recipe or two (or three)? 2 tablespoons of quick cooking tapioca or some other thickening agent. Dump all ingredients (except water) into two, one gallon bags. Label and put in freezer. Day of cooking dump contents of bag into slow cooker, add the water, and cook on low for 4 to 6 hours, or until fully cooked. Remember each slow cooker is different, so the first time you make a recipe, really watch it so you don’t over or under cook it. Serve with sauteed broccoli in lots of butter. I cook frozen broccoli this way, no need to thaw, just dump frozen broccoli into a hot pan with hot butter and it is delicious. 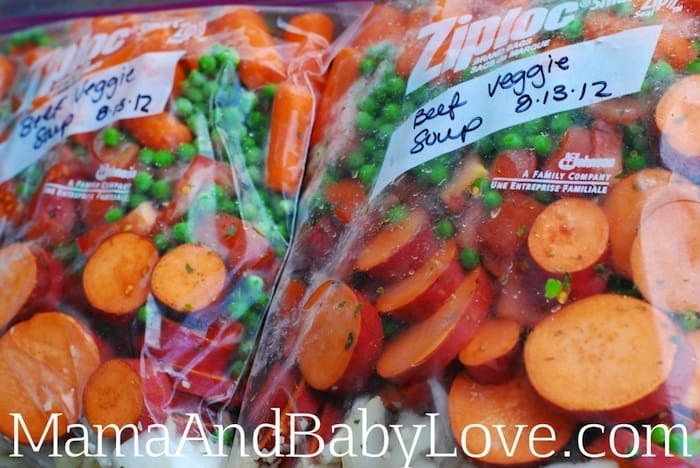 Divide everything into two separate one gallon freezer bags, shake it up, seal, label and put in the freezer. 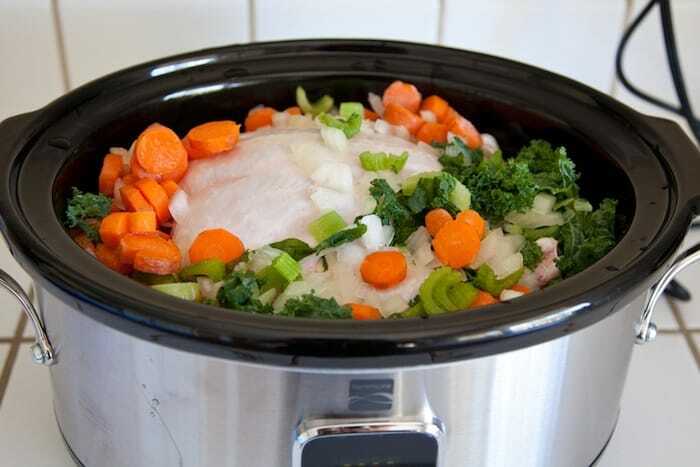 On the day of cooking, dump it into your slow cooker and cook on high for 4 to 6 hours, or low 6-8 hours, depending on your specific slow cooker. Directions: Label 1 one-gallon freezer bag. Chop sweet potatoes and scallions, then add to freezer bag. Add in sugar, arrow root flour, soy sauce, garlic and orange juice. Mix up well and then lay bag flat and place in freezer. Day of cooking: add contents of freezer bag, roast, 2 cups of beef broth, salt and pepper to slow cooker. Cook on low for 8 hours or high for 4 hours. Serve with fresh salad and homemade sourdough bread, if you have it. I love freezing crock-pot meals! The only problem I have with it is remembering to take them out of the freezer long enough before they’re needed to thaw. My crock pot isn’t big enough to hold a gallon-sized frozen slab! It’s too bad, too, because it would be so much easier to just let them thaw in the crock pot. You are in luck Rachel! You put these meals into your slow cooker FROZEN! I usually will let the bag sit on my counter for about 10 minutes to thaw it enough to peel away from the plastic bag and slide out. Then I will mash it with a wooden spoon to break it up into chunks if I can’t get the lid on and then turn on your slow cooker and you are DONE! Rachel actually states she can’t fit a frozen slab in her crockpot. I’ve cooked 2 big batches of these so far! Life saving! You divide the ingredients between the two bags.. So if it says 2 pork roasts- put one in the first bag and one in the second bag. I have found each bag serves approx 4-6 depending on the recipe. I just want to make sure i’m understanding, So when it says 1 TB of sugar, you would divide that in half for each bag, and put a half tablespoon in each? I love the crockpot and will be trying these recipes! Thanks for the great ideas. What a fab idea!! Do you even bother using a bowl to mix things or just put them straight in the bags? I’ve been looking for slow cooker recipes that aren’t so stew/casserole like cos hubby doesn’t like the texture but these sound great! The BBQ chicken sounds nice. One thing, on the pork recipe calls for rapadura sugar. I’ve never heard of this, what is it? -what size should the roasts be? 2 pounds? -for the water, do I add 1 cup to the crock pot on the day of, of a 1/2 cup (since all the other ingredients are divided in half)? -can I add the beef frozen, or should a brown it and then add it to the crock pot with the rest of the freezer bag ingredients? I am thinking I will brown the beef ahead of time when I prep all the meals and then add it browned, but frozen (if that makes sense). Thanks for letting us try these recipes out before buying the ebook! 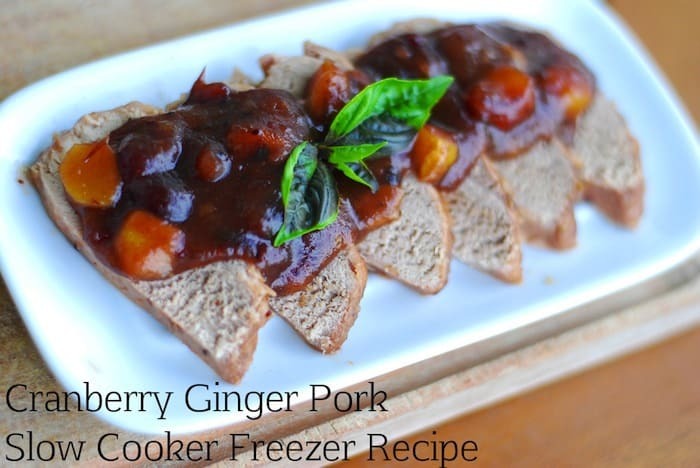 What size pork roasts should I get for the cranberryginger pork? What size pork roasts should I get for the cranberry ginger pork? I’ve been browsing online over 3 hours nowadays, however Irrrve never discovered virtually any exciting report like you. It can be beautiful worthy of adequate in my situation. In my opinion, in case most site owners and blog owners produced good information just like you would, the internet may be a great deal more helpful than before. For those who have certainly not gamble in sports prior to deciding to will likely gamble in sports you like it enjoying. sportsbooks of which fascination people.